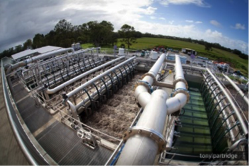 The Ballina Shire Council in New South Wales Australia recently completed a $45 million upgrade of their WWTP to a Membrane Bioreactor (MBR) facility. Aquality Water Management worked with engineers and contractors to startup and commission the facility, assist in the development of standard operating procedures and emergency response plans, developed a comprehensive Operations Guide, trained operations in lab procedures and trained staff in the proper operation of the MBR system. It was necessary to keep the old system in service while performing the transition to the new system. Some of the recycled water is being used for residential properties with dual reticulation systems, urban open spaces (parks, golf course, race course etc.) and some commercial systems.